Missing teeth not only look unappealing, they can also cause a number of dental problems. The spaces left by missing teeth can become an area for bacteria to accumulate (since you don’t brush or floss there) which can make the surrounding teeth more susceptible to decay. The empty space can also cause the surrounding teeth to begin shifting which can cause misalignment and even a bad bite. This can create problems with your bone and teeth, and issues with biting, chewing, and even speaking. Replacing missing teeth is a must since it assists in avoiding dental problems. 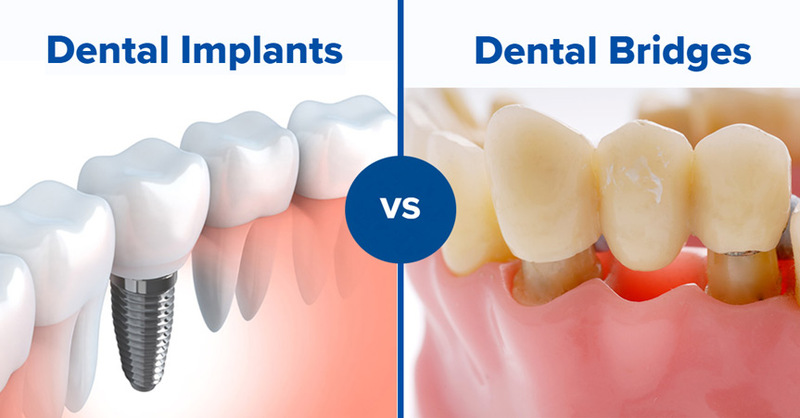 Two of the most popular teeth replacement options are dental implants and dental bridges. Both bridges and implants provide strong, natural-looking tooth replacements which can help enhance your smile and improve the functionality of your mouth. · Preparation: Bridges require the surrounding teeth to be prepped by shaving them down, so a crown can be fitted to act as an anchor for the bridge. Dental implants do not require the surrounding teeth to be prepared since they are surgically fitted directly to the jaw bone. · Cleaning: Dental bridges require more care and caution when cleaning since plaque, tartar, and dirt can build up in the spaces beneath the bridge. However, the replacement teeth used for implants are fitted directly onto the metal post leaving no spaces or gaps. This means keeping dental implants clean requires less intensive work. · Longevity: Dental implants make use of abutments to connect the artificial root to the artificial tooth. It is usually made from titanium making the replacement tooth resistant to decay and gum problems. This means that dental implants are more durable and can last a lifetime whereas bridges usually last about 10 years. Bridges use the surrounding teeth as an anchor and these teeth are still susceptible to damage and decay which means that the bridge can loosen over time. · Cost: Dental bridges are less expensive than implants, but they may need to be replaced over time. On the other hand, implants, whilst more expensive now, will save you money in the long run since it can last you a lifetime. · Procedure length: Dental implant procedures take much longer to finish and because they are fitted through surgery, you will need several months to recover before the implant procedure can be completed. With dental bridges, the fitment process can take 2 appointments to complete and there won’t be a need for recovery since no surgery is required. · Problems: Dental implants are fitted through surgery which means there is a risk of suffering from an infection which you won’t get from having bridges fitted. · Candidacy: Bridges depend on the surrounding teeth for proper fitment, so the good health and stability of the surrounding teeth is an important factor in determining your candidacy for dental bridges. If you suffer from tooth decay, gum disease, have chips or cracks on your teeth, you may require additional treatment to strengthen the teeth so that they can support a dental bridge. · Jaw health: Dental implants involve fitting a small titanium cylinder directly to the jawbone. This cylinder bonds with the bone tissue in a process called osseointegration. This process greatly supports jaw health keeping the bone strong and healthy. This maintains both your oral health and your facial shape. Dental bridges are attached to the surrounding teeth and therefore place more strain on them. It can also lead the bone repositioning itself creating instability. Choosing between dental bridges and implants can be difficult but your dentist will be able to offer you the best advice. After thoroughly examining your teeth and mouth, he will be able to tell you which treatment you qualify for and which would be best for your specific case. To avoid the loss of more teeth or any other dental or oral problems, make an appointment to have your teeth replaced as soon as possible, so you can keep flashing your full and brilliant smile! If you would like to learn more dental bridges and dental implants, and which would be the best option for you, then book an appointment with us by calling 08 8948 1225 or send us a message via our Contact Us page.